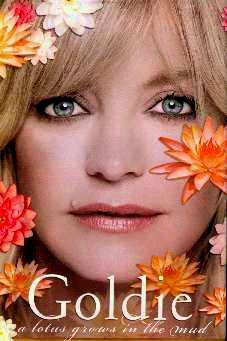 Goldie Hawn has long been known as the "kooky one" and God bless her for her quirkiness. In this biography, her mission is to let us know that life's obstacles are learning steps and so she shares with us her steps along her life's journey. True, life is a series of learning steps, but who'd have thought so many of us have so much to learn - on the outside, most famous people all seem so confident which is why, I believe, you shouldn't judge a book by its cover - take the time to see what's below the surface because you just never know what that person's life has been like. Enter Ms. Goldie Hawn. In her book Ms. Hawn delicately writes about the people who came into and out of her life, both as friends and/or romances. She begins her tale with her early and formative years back in Maryland and her beginnings as a dancer. She says, "I owe so much of who I am to my dancing. I learned about timing and personal discipline. I learned about my own physicality", and, "Through rigorous exercise in my early years I developed muscles, posture and, most important, I learned what it is to sweat." Great early development and then she takes us through her childhood regaling stories about her "different" parents. Her book is broken up into sections on joy, compassion, fear, life's purpose, choices, laughter, fate, and death among many more, and her experiences through different periods in her life, and how she learned and grew from them. Most interesting, for me, were her trips to India and Kenya and how she grew because of where she was and who she met. A very inspiring look at one of our brightest stars and a very enjoyable read. I loved her quote at her "life's purpose" chapter: "True rewards come from the intention of living an honorable life". Having gone through some scary times, Ms. Hawn shares with us her private life and thoughts. Not only is this book about her own life, she also gives great advice on passing on traits to your children and to give yourself time to search for your being. Kooky she is not. Conclusion - At last, we now know who Goldie Hawn is and what she's all about. Well written and a joy to read.